"A vivid portrait of second-generation immigrants living in suburban New England...Sawhney is pitch-perfect when describing the uneasy relationship between adolescents and their parents...There is much emotional truth in the author's sensitive portrayal of the despair and rage that can simmer away throughout adolescence...Hirsh Sawhney's quietly devastating conclusion is both unexpected and deeply moving." " T]his luminous debut...captures precisely the heartache of growing up." "Sawhney's debut novel, a coming-of-age tale mixing grief, violence, and extremism, follows the life of Indian-American teen Siddharth Arora as he deals with the death of his mother, political tensions at home, and attempts to fit in amongst the bored and troubled youth of his Connecticut suburb...With shifting teen angst colliding with his new, upturned reality, Sid becomes aware of his failings and mistakes as he discovers what it means to be loyal to the ones you love. This is a fantastic debut about growing up as an outsider in a divisive environment." "Sawhney weaves together his own plot, with heartbreaking difficulties about confronting the complexity of identities, with nationally and locally important issues like Islamophobia, all painted on a southern Connecticut backdrop." "In his debut novel, South Haven, writer Hirsh Sawhney chose his native New Haven and suburbs as backdrop for this part tale of mourning, part coming-of-age story...Sawhney skillfully captures Siddharth's readjustment to a life without his mother. Much of this readjustment centers around the different and complex relationships Siddharth forms with the handful of friends he makes following his mother's death, his college-bound brother, the 'new woman' in his Dad's life, and with his larger-than-life father, a radically opinionated academic who is caught between what it means to be American and the culture he's left behind." "A powerful story...a universal look at the complexity of how people wrestle with guilt and blame amid tragic loss." " A] sensitive, poignant, resonating novel." "A raw portrait of a motherless family...poetic... Sawhney's] characters are distinctive: They open up differently, more ominously, than American fiction's best-known South Asians of the Northeast--Jhumpa Lahiri's... and] exhibit an outsider-ness without glamour." "An unforgettable and unnerving tale of grief and migration." Siddharth Arora lives an ordinary life in the New England suburb of South Haven, but his childhood comes to a grinding halt when his mother dies in a car accident. Siddharth soon gravitates toward a group of adolescent bullies, drinking and smoking instead of drawing and swimming. He takes great pains to care for his depressive father, Mohan Lal, an immigrant who finds solace in the hateful Hindu fundamentalism of his homeland and cheers on Indian fanatics who murder innocent Muslims. When a new woman enters their lives, Siddharth and his father have a chance at a fresh start. They form a new family, hoping to leave their pain behind them. 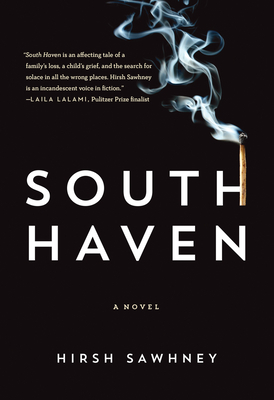 South Haven is no simple coming-of-age tale or hero's journey, blurring the line between victim and victimizer and asking readers to contend with the lies we tell ourselves as we grieve and survive. Following in the tradition of narratives by Edwidge Danticat and Junot D az, Sawhney draws upon the measured lyricism of postcolonial writers like Michael Ondaatje but brings to his subjects distinctly American irreverence and humor. Hirsh Sawhney's writing has appeared in the New York Times Book Review, the Guardian, the Times Literary Supplement, the Financial Times, Outlook, and numerous other periodicals. He is the editor of Delhi Noir, a critically acclaimed anthology of original fiction, and is on the advisory board of Wasafiri, a London-based journal of international literature. He lives in New Haven, Connecticut, and teaches at Wesleyan University. South Haven is his debut novel.